As time progresses, more and more players join the IL-2 community have difficulties setting up head-tracking. One of the more common issues I come across is the installation and configuration of a head-tracking clip/hat and head-tracking software. To help these new players, I took it upon myself to write a clear and elaborate guide that will help anyone setup a new head-tracking system with the use of Opentrack. I will keep the topics separated by chapter to keep a clear distinction between the different elements. Keep in mind that this is purely based on my experience and that of those I talked to. Your experience may differ! Before we start, here are a few things that are useful to know the meaning off. DoF: Degrees of Freedom. How many axes of movement are recognized. Tracking Clip: a clip that connects to your headset with 3 IR lights. Tracking Hat: a baseball cap with 3 IR lights. IR filter: an infrared filter that removes all light except for IR light. Curves: see explanation in the “How head-tracking works” section. Point of rotation: The point around which your head rotates. To understand head-tracking, you need to understand 3 things: the hardware, the head movement and the curves. Headtracking can be done with several systems. I will discuss the most common and most reliable method in flight sims: an infra-red camera with infra-red LEDs mounted to via a clip or hat. The camera: Most cameras have a filter that will remove infra-red light out of the picture as this will cause unwanted brightening of the picture. However, for head-tracking, we want the opposite. By only using infra-red light, we can easily track a small infra-red LED light without the interference of other colours. The infra-red light is not visible to the human eye but is easily visible to a camera. The most common camera used is a PS3-Eye camera. This camera needs to be modified so that it will only detect infra-red light (Unless you buy the PS3 Eye from TrackHat or DelanClip. They are premodified). Infra-red LED’s: On the Tracking Clip/Hat, you will find three infra-red LED’s. These LED’s emit only an infra-red light. These 3 lights are positioned in a specific orientation so that when you move your head, their relative position will change. This relative position is then used by the program to figure out how your head moves. These movements are translated by a head-tracking program like Opentrack into movement of your head on the screen. This is done with the use of curves. When dealing with head-tracking, a glaringly obvious problem will present itself. To look towards the sides, backwards, and up or down, you need to turn your head. However, your monitor does not move with you when moving your head. This means that when you look back, you can’t see your monitor anymore. To solve this problem, a multiplier is used. For instance, when you move your head 5 degrees right, the game will move your head 30 degrees right in-game. These multipliers can be tweaked to your liking. You might like a dead zone in the middle; a zone where your small movement will lead to no movement in-game at all (useful for looking down the sights). The great advantage of these multipliers is that they can be tweaked to get different effects. For instance, if I want small movement when looking forward but large movement when looking back, then you can use curves. These curves are fully adjustable and should be set to your liking. Keep in mind that it will take a little bit of time to get used to these curves. However, you get used to them quite quickly and then you won’t even notice it is there. It will feel natural. Why should you get a head-tracking system? Headtracking may seem a bit daunting in the beginning. There are many reasons why you should get into head-tracking. I will list a few of them below and discuss them. These are probably the most important reasons why you should get a tracking setup. Hence why I placed it first. The main reason most people have given is the ability to scan the sky for opponents and tracking your opponents during a fight. I totally agree with this. The fluid movement of the head and the ability to focus on and follow your target give you a huge advantage over someone who does not have head-tracking. During a flight with a wingman, you can keep easy track of your wingman and find him again easily when you lose track of him. I also found that it helps with navigation. It is much easier to find ground objects that will help you determine your position. Lastly, I found that it helps with reading the instruments in the cockpit. I exclusively fly with the instruments and not with the tech messages on the side. Without head-tracking, it is much harder to look at the different instruments as you can’t really look at one specifically. Although there are expensive options like VR and TrackIR, there are also several cheap options. TrackHat and DelanClip, for instance, provide a complete setup for only 35-40 euro. A DIY system can be made for as little as 10 euro! If you are willing to make it yourself. If you follow this thread, it will be easy, and you are good to go in no time. Once it is set up, you will probably never have to look at it again. There are much more so let me know if you know a game I need to add. TrackHat, this is a good price/value option. The cheapest complete starters set is 37 pounds. In this starter set, you get a modified PS3 eye camera, cabled TrackHat clip, instruction manual and all software is provided. All elements can also be bought separately. The TrackHat Clip is durable and will last you a good while. This product is reported to be very easy to setup with good customer support. DelanClip, not used as much as the TrackHat but does seem to be a good alternative to TrackHat. A bit cheaper then TrackHat but has the wiring exposed. 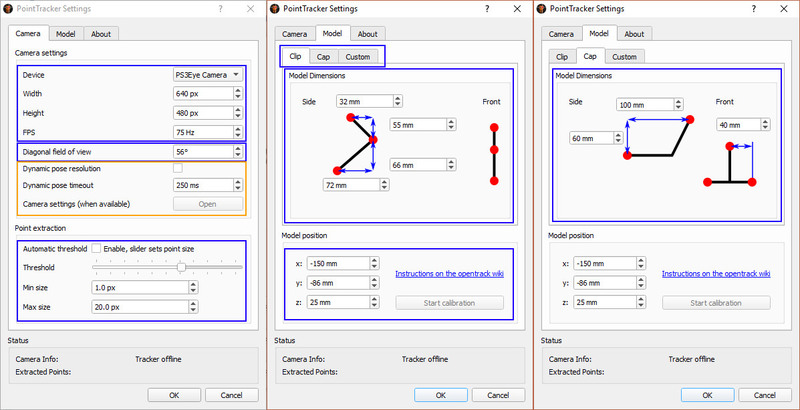 Do It Yourself Tracker with PS3 cam and Opentrack: this is by far the cheapest setup. Investing some of your own time, you can get a fully operational setup for as little as 10 euro. (prices will vary from place to place). It will take some knowledge and research to build your own tracking clip and modify a PS3 camera. The advantages speak for themselves though. 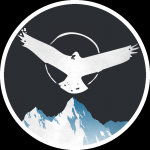 Cheapest of all options, highly stable, reliable Opentrack software, and 100% customisable. This setup is (if setup correctly) much more stable than TrackIR. TrackIR 5: TrackIR was the pioneer in the head-tracking industry but has become terrible price/value deal. There are equally good or better options for a lower price. However, the curves are easy to setup and are very smooth during use. This product is by no means bad. It works well and is quite easy to set up. It is just incredibly expensive compared to the competition. Which you choose is up to you. From experience (yes, I used both), I can say that it depends on whether you use headphones or not. With headphones, a clip, mounted on the side, is easier. It is smaller and does not block your vision at all. I do not recommend using a tracking hat with headphones as it can create an uncomfortable feeling (your experience may differ). The cap can also (depending on your curves) block your view when looking down. If you don’t use headphones, then it is much easier to use a Tracking Hat as there is nothing to mount a clip too. Tracking accuracy is not of importance when choosing one of these. They will give you the same performance. This is a personal choice. I have written the advantaged and disadvantages below. It is up to you to choose which you prefer. Takes up a USB slot. Although both have their advantages and disadvantages, it is up to you to decide which to choose. I can, however, give you my experience since I have used both (both DIY). I find the cable a large improvement over the battery. The reliability is the largest selling point for me. Combined with a headset that has a cable, I simply don’t notice the cable during flight. The restriction posed by using a cable is also not really a big deal since I have enough slack in the cable to compensate. I found the batteries annoying as they would constantly die. I used a homemade system with 1 9V rechargeable battery. Even though I had 2 batteries that I could swap quite quickly, they did always die at the worst possible time. During dogfights or when starting a bombing run are the most annoying. 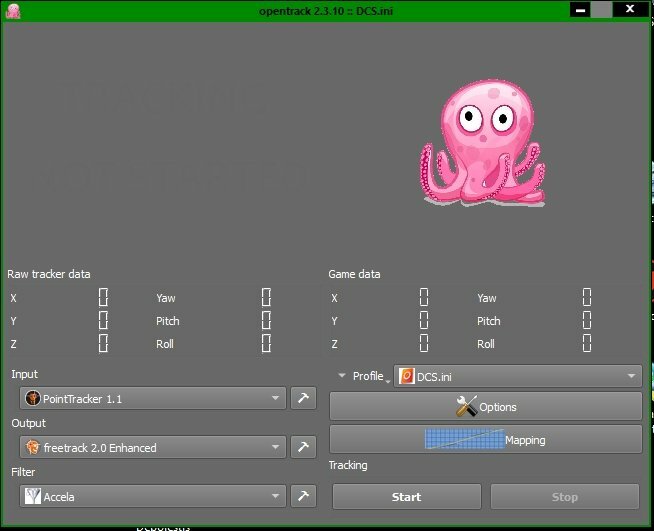 In this guide, I will walk you through the steps to set up an Opentrack setup as this is currently the best software (and it is free). The coolest part about Opentrack is that it will work with pretty much any setup and product. Below I have listed some of the best options and where to get the hardware and software. The easiest method is to buy a complete head-tracking setup. This will guarantee you a working product and does not require any modification by you. Make sure to get a Tracking Clip or Hat AND a PS3 Eye camera. I might make a guide on how to make your own tracking system, but for now, this will do just fine. Installation is quite easy. However, here are a few points you need to pay attention to. Tracking Clip: Attach the clip to the side of your headset. Which side is up to you. You will notice one long arm on your clip. This long arm should be the lower arm. It is best not to place the clip horizontal on top of the headset since opentrack is not designed for that. Tracking Hat: Put it on your head but NOT backwards! Camera: the camera is best placed on top of the monitor. Opentrack is designed to work with this and should, therefore, work best when placed there. Trackhat: When using a Tracking Hat, it is best to place the camera in the middle of your monitor. This will give you the most freedom of movement in all directions. Trackclip: since the clip is offset to the side, you might want to do the same with your camera. Place your camera in line with your tracking clip. It is not really necessary but it might avoid some freedom of movement issues later on. There are other options like FaceTrackNoIR and Freetrack. However, I found Opentrack the most reliable and it is the only free head-tracking software that is still updated on a regular basis. 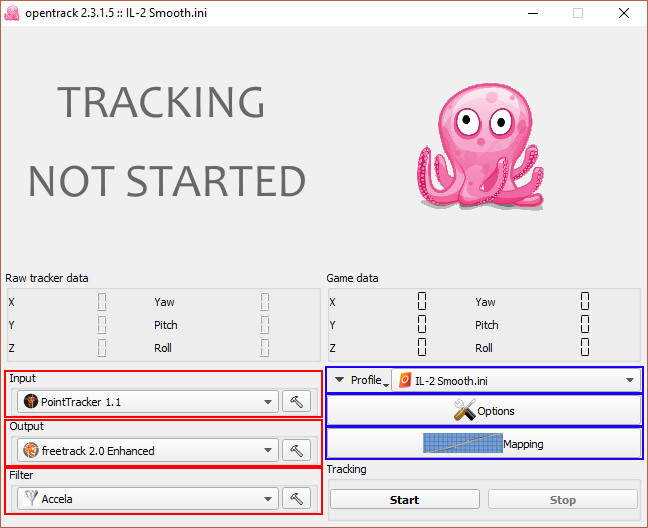 TrackHat has its own modified version of Opentrack called “TrackHat Opentrack”. !!!  Do not use the TrackHat version of Opentrack! Based on issues brought fourth by you guys, I learned that it contains several problematic bugs that the original Opentrack does not have! !!! The only software you need to install is the Opentrack and the CL-eye drivers. The installation of both software is straightforward and should not need any explanation. We have finally reached the point where we can set up your head-tracking system. The easiest method is to go through each screen one by one. I will use various images to point out what I am talking about. Red outlines in the images show you what settings you really should use. Using other settings might not work. Blue outlines show you what you can change depending on your setup or liking. Orange outlines show unimportant stuff that you don’t have to worry about. Just leave it as is. Before you start with Opentrack. You need to set the camera to its correct settings. To do this, open the program CL-Eye Test. 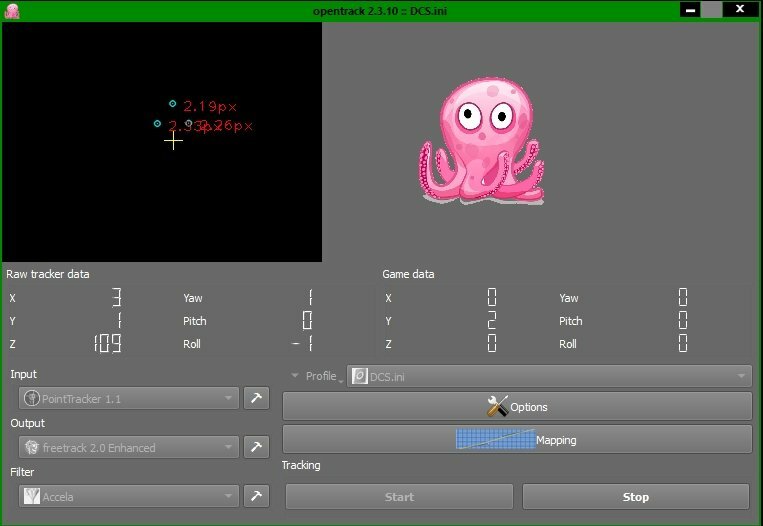 This program allows you to test the camera and change some recording settings. Set the "Gain" Slider all the way to the left. Set the "Exposure" slider all the way to the right. Set the "White Balance" sliders all the way to the right. Make sure the “Auto” Boxes and "Colour bar" box are unchecked. If you find that the settings don’t work well for you, feel free to play around a bit with the different sliders to get the best result. Hit “OK” when you are done. Now close CL Eye Test as you won't be needing it anymore. (except for small tweaks). Now you can open Opentrack. This screen is the one you will see the most. This shows you all relevant information when using the head-tracking software. The start and stop buttons do exactly what you think they do. No need for further explanation. “Profile” gives you the option to create a new profile. 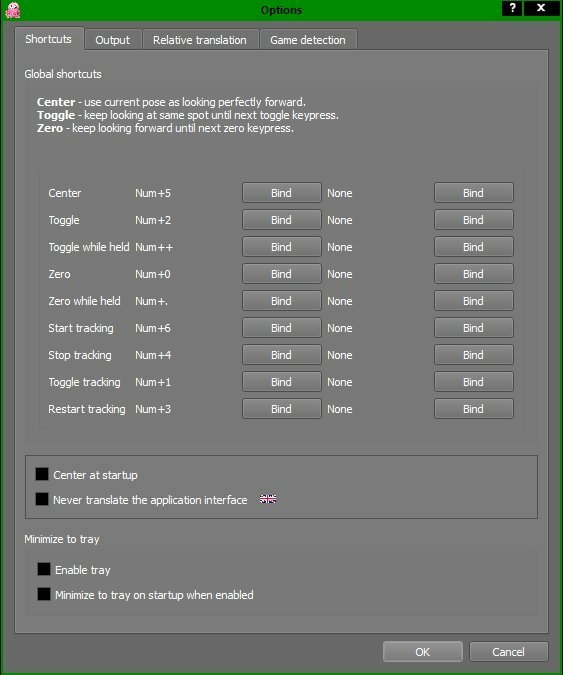 Do this before you set up your new mapping and options settings. You can have as many setups as you like. In general, you need one for each game since one game might handle the data differently from another. Click on the little hammer on the right of the drop-down menu to go to the PointTracker Settings window. Here you can set up your camera and your tracking clip/hat. 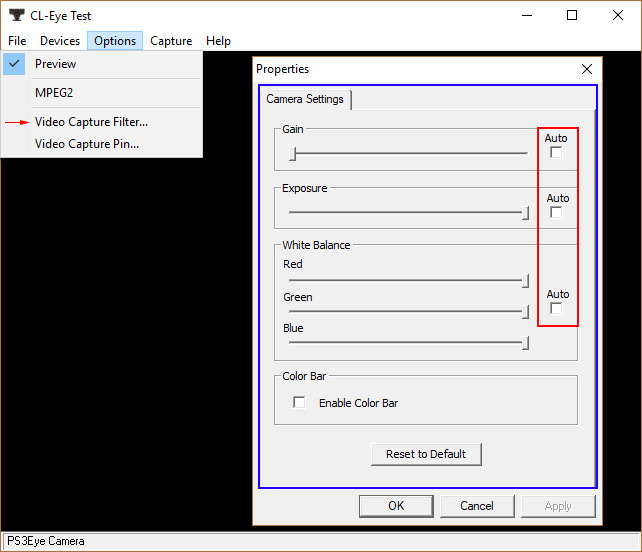 Camera Settings: You want to set these as displayed in the image if you use the PS3 Eye. This will give you the smoothest result. If you use a different camera, you will have to adjust these settings according to your camera’s specifications. Diagonal field of view should be set to either 56 (red dot) or 75 (blue dot) for the PS3-Eye Camera. Point Extraction: Here you can set the threshold between which a point is used or not. You will have to play with this to set it correctly for your unique room and setup. The “Threshold” option lets you set how bright a dot must be in order to be picked up. “Min size” Lets you set the smallest size a dot can be to be used. If the dot is smaller: it is not used. “Max size” Lets you set the largest size a dot can be to be used. If the dot is larger: it is not used. I suggest disabling “Automatic threshold”. Does not work all that well. It is better to find your own settings. TIP: Set the Point Extraction on a sunny day. That way you can set it up to work both in daylight and night-time. 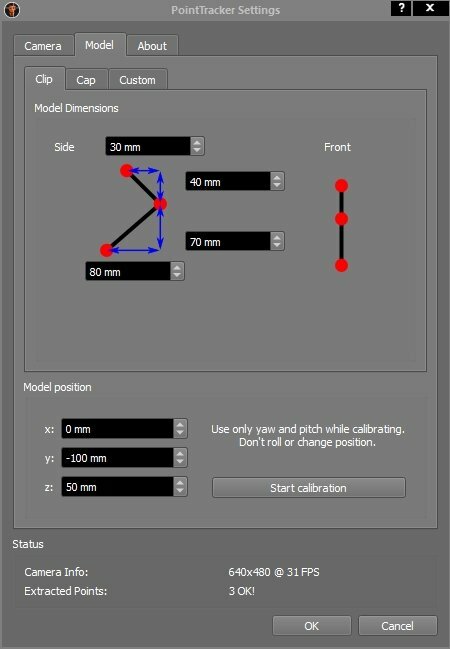 Model Clip: here you can set the dimensions of your clip. Make sure to measure these from your tracking clip. Note: the values in the images are my custom settings. Yours will differ! Model Cap: Same as Model Clip but for when you use a Hat. Model Position: this is a crucial thing to set up. Your head-tracking clip/hat is offset from your point of rotation. This means that it will translate your movement incorrect if you move your head. To fix this, you must calibrate your system. Simply click the start calibration button (head-tracking must be started before you can click Start calibration) and move your head around a bit. Stop the calibration and it will have found a point that is quite close to your point of rotation. Note: it is highly unlikely that finds the exact point but that won’t really be an issue. If you want a better result, you can adjust it manually. X 0 Y 0 Z 0 is chosen as one of the 3 LED's. This could differ per user. Set this to Freetrack 2.0 Enhanced and leave it alone. No need to change the settings. 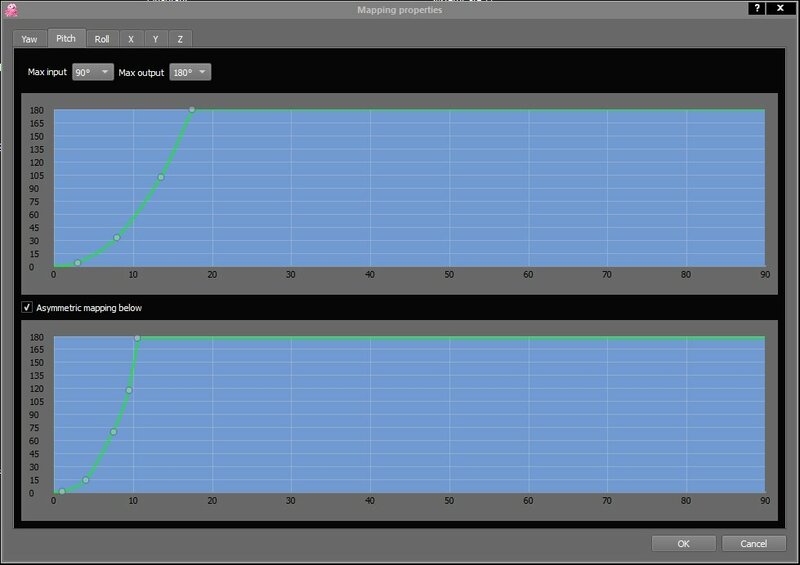 The filter takes your raw data and smoothens it a bit so that you don’t get any annoying jittering when looking around. 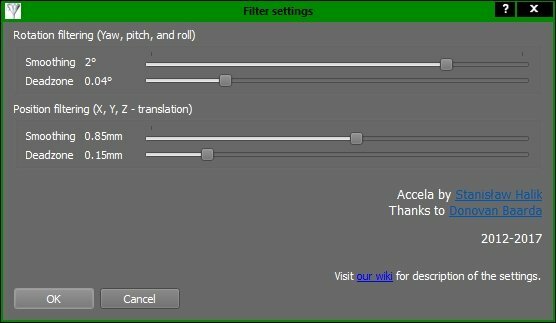 I use the standard Accela settings. If you want to smoothen it a bit more. I suggest only moving the “general - Smoothing” by a few milliseconds. Any smoothening will introduce a slight delay. If set low enough (say 2ms), you won’t really notice this delay. Note: As of version 2.3.10, the "General" and "Rotation nonlinearity" have been removed. They are not really needed anyway. The other settings should work fine unchanged. Note: I use a slightly older version of Opentrack (I use 2.3.1.5). Your options menu might have some features added or removed! In the options, you can set how your Head-tracker works. Here you can set up your preferred shortcuts to start and stop your head-tracking. I am not going over each individually but I will provide you with the important binds. Center: This will recenter your system and take your current head position as the new "looking straight forward". Toggle: will "pause" the system and lock your head position. Press it again and you will go back to tracking again. Zero: Locks your head in the centered forward facing position. If you use "Neck displacement" in the Relative translations tab, then you can still move left, right, up, down, forward, and backwards but all forms of rotation are locked. Toggle tracking: this does the same as "Start tracking" and "Stop tracking" but on a single button or button combination. Restart tracking: It stops and then restarts your tracking. Camera Angle compensates for an offset camera. 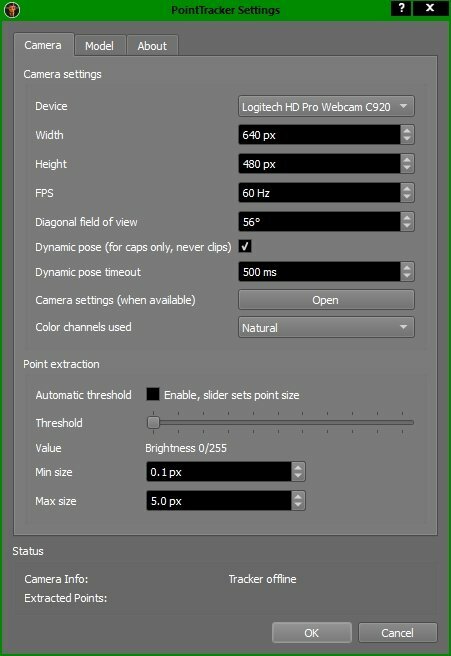 If your camera is to the side, this will let you set the values so that moving towards the middle of the screen will also result in your in-game head moving to the middle of the screen. Custom center pose allows you to set a custom “forward” view. I advise you leave this alone. You really don’t need it. Centering method allows you to set what type of tracking technology is used. Leave this on Absolute as this is how camera head-tracking works. Here you can set how your head movement is translated. In general, you should leave most as they are. My personal setup has Roll disabled since it gives a bit more of a realistic feel. What settings you use is up to your personal preference. CSV Data Logging: leave this off. It is only useful if you have problems with tracking. In all other situations, it is just annoying. Relative translation allows you to change how head movement is translated when you look to the side or to the rear. For instance: when you look behind you and you want to move your head to the right, then you will have to move your head to the right. Leaving this off will mean you have to move your head to the left in order to move to the right when looking back. Neck displacement will offset your eyes based on where your point of rotation is. With this off, your head movement in-game is basically as if your eyes are a single dot at the same place of your point of rotation. That is not what happens in real life. With these settings, you can set the horizontal and vertical distance of your eyes from your point of rotation. Note: this is different for each person. Set your own values. Here you can add games and link them to different profiles. 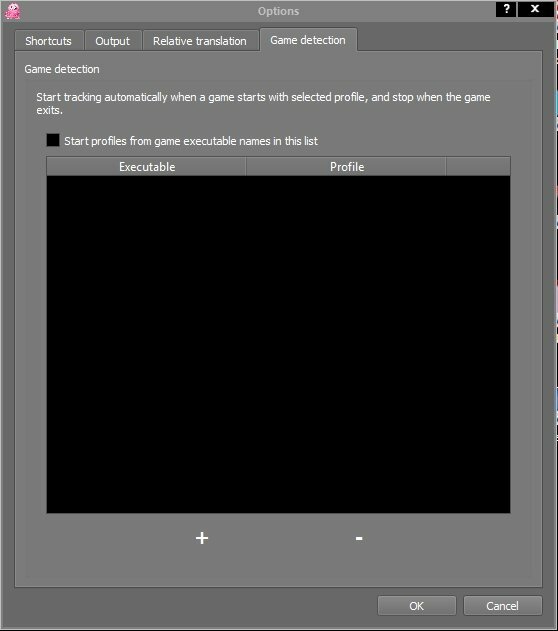 Opentrack will then activate your desired profile when you start a game. Click on the “…” button right of the newly added line. Find the .exe file of the game. (For IL-2 Grand Battles it is IL-2.exe). Press the drop-down below "Profiles" and select the profile you want to open with that game. Hit "OK" and you are done. This is probably the most important part to set up to your liking. These settings will determine how your head movement will be translated in-game. Let me talk you through the basics. Yaw, Pitch, Roll, X, Y, Z in the top indicate which of the axis you are changing. Max rotation: This sets how far you can rotate your head in degrees. Usually, 30 or 45 is enough. It is not very likely that you will rotate your head more than 45 degrees. Max translation: This sets how far you can move your head. (forward, backwards, side to side, etc.) I have mine set to 10 or 15 cm. Horizontal axis: the horizontal axis in the diagram displays how many degrees or cm you have moved your head in the real world. 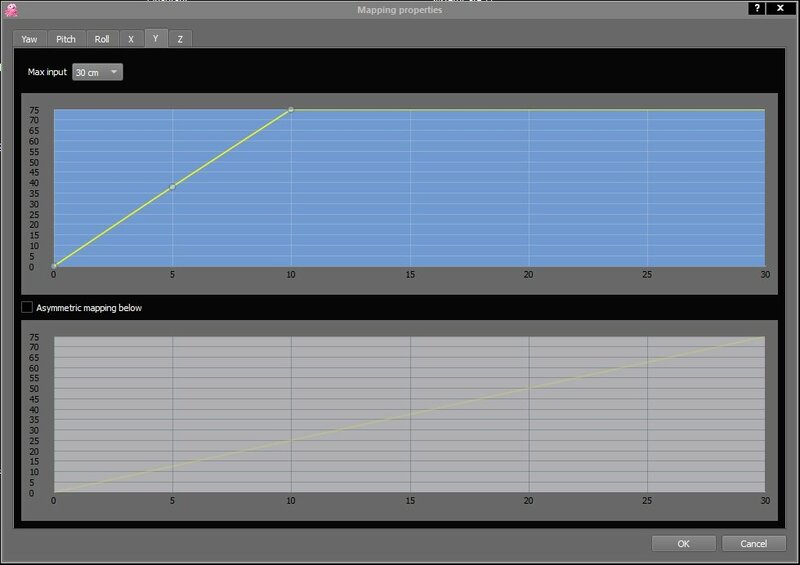 Vertical axis: the vertical axis displays what angle the program will send to the game. Indicator dot: the indicator dot is a grey moving dot that will show you where you are looking at that very moment. Curve dot: the curve dots are grey dots you place on the line to change the path of the line (curve). Asymmetric mapping: Asymmetric mapping lets you create different curves for when looking one way or the other in the same plane. This is most useful for when looking up or down. How do you set your “curves”? I use this method for all axis. If you follow these steps you will have all axis setup in no time. For this explanation, I use the Yaw axis, but it works for all axis. Create a new profile: Click on “Profile” on the main screen and click on “Create new copied config”. Add a name you like. This will copy your profile. This is useful since you will preserve your old settings. If you mess up. You can simply restart with your previous profile. 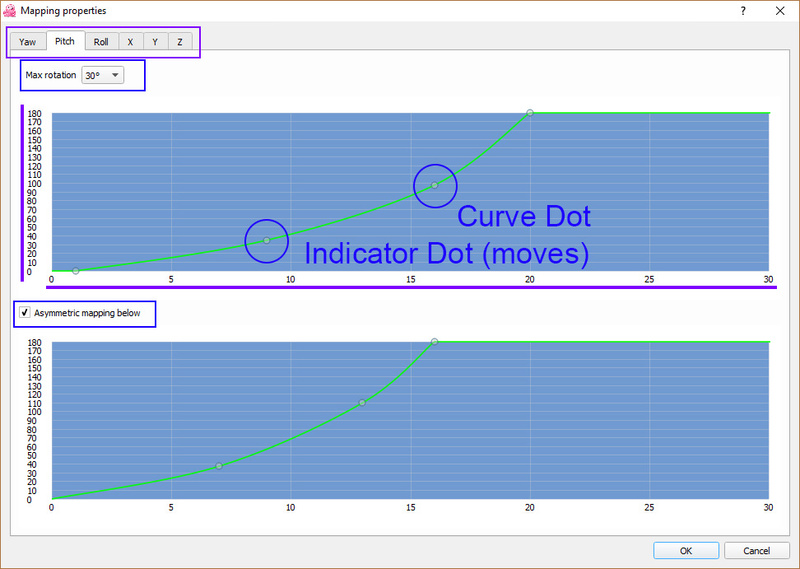 Start your head-tracking: you must have it on to see the indicator dot move on the mapping curve. Open the Mapping Properties: click on the “Mapping” button on the main screen. Finding the Maximum point: Rotate your head to the right so that you look straight at the edge of your monitor. Now carefully look at where the indicator dot is based on the horizontal axis. This point above the horizontal axis is your maximum point. Setting the maximum point: set the maximum point by clicking anywhere in the blue box. A grey curve dot will appear, and the curve will change. Now click and hold the dot so you can drag it to the top of the blue box right above the maximum point you found in step 2. You now have a linear translation. This will give you the most realistic effect, but it can feel a bit twitchy when looking through the sights. Setting a dead zone: (optional) to set the dead zone, click anywhere in the blue box but to the left of the maximum point. Now drag this dead zone point all the way to the bottom left so that you only see a small horizontal line. If you want a larger dead zone, drag the dead zone point a bit to the right. 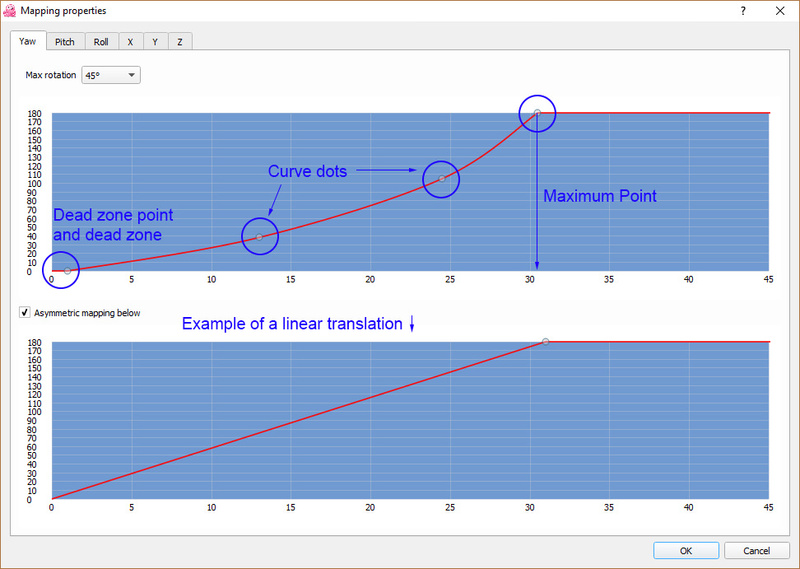 Creating a curve: (optional) If you don’t want a linear translation. You can create a curve. The image below shows a curve very close to mine (mine has no dead zone). With a curve, you can change how your head movement is translated. The curve shown below does the following: small head movements in real life (in a generally forward direction) translate to small head movements in-game. However, when looking backwards (Looking towards the side of your screen), a small head movement will translate to large head movement in-game. You can create these curves by adding more curve dots and placing them where you like. It is completely up to you how you want these curves. Tip: make the curve as smooth as possible. Sudden bumps are very noticeable and feel unnatural. 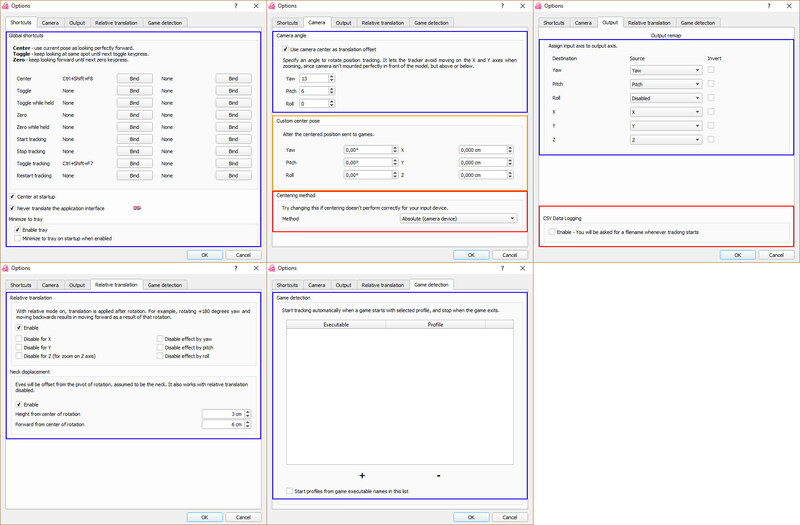 Asymmetric mapping: (optional) To set up the asymmetric mapping, click the checkbox. The bottom diagram will now become blue and can be edited. Change it to your liking following the steps 3 through 7. Test your setup: Click on “OK” in the bottom right to save these settings. Open the game you want this head-tracking profile for and test if you like it. You can make changes to the curves while you are in-game and test them right away. No need to close the game or the "Mapping properties" window. Setting the other axis: simply click on the next Yaw, Pitch, Roll, etc. tab in the Mapping properties and redo steps 3 through 9. These steps should guide you smoothly through the process of setting up your curves. It might take some tweaking to get something you like. Of course, using a new program requires some trial and error. Luckily, you don't have to go through this process all alone. Here are a few common problems and how to solve them. There are several ways that Opentrack could lose track of your LED's. The most common way is where one or more of the LED's gets covered up or falls outside of the camera's field of view. Usually, Opentrack will reacquire the lost LED('s) and track normally. However, sometimes Opentrack reads the LED's wrong and your tracking will no longer match your head movement. To fix this try the following steps. They should fix your problem. Try to recenter your headtracking. Use the "Center" shortcut key to do this. If that does not work. Try to restart tracking. This can be done either by using the "Restart tracking" shortcut key or by manually stopping and restarting Opentrack. It is possible that light from another source (sun, lamp, reflection, etc.) is interfering with your LED's during use of Opentrack. In this case, follow the steps of "Opentrack is not picking up the LED's". The LED's on your tracking clip or hat are not the only objects in this world that can produce infrared light. This light is all around us and almost every light course will emit it. For Opentrack to find your LED's, you will need to be sure that opentrack and your surrounding is setup correctly. These steps will guide you through the process. Close CL Eye test before you open the Opentrack Program. Only one program can use the camera at a time. Thus, if you have the camera feed open in CL Eye, you cant use it in Opentrack. Make sure no direct sunlight is entering your room. Close your curtains and try to leave no gaps. You don't need to darken your room completely but just make sure that any light entering your room has to go through a curtain or some other form of fabric. Remove any small light source that is in the field of view of your camera. Either move them out of the field of view of your camera or turn them off during use of Opentrack. Large lights can be left in the background since they can be filtered out with the next step but make sure this light does not end up behind one your LED's when moving your head. Remove any reflective items or make sure they don't reflect light from another source. It is possible that an object or mirror in the background is reflecting enough light to interfere with Opentrack. Either remove these objects, the light source they reflect from or cover them up with something non-reflective. Ensure that your "Point extraction" is set correctly. You can find out how to do this by scrolling up to the section "Setting up your Opentrack" --> "Main screen" --> "Input". Make sure to set it so that the large lights in the background are not picked up. This is best done during a sunny day. This will ensure that your tracking works both during the day and the night. Calibrating your Opentrack can only be done when Opentrack is tracking your movement. Start opentrack and try to calibrate again. For manual instructions; go to the section "Setting up your Opentrack" --> "Main screen" --> "Input"
It could happen that Opentrack is translating your head movement wrong. For instance, you move your head up but in Opentrack your view goes down. Or you roll your head left but it rolls right instead. This is easily fixed. On the main screen click on "Options" and go to "Output". Check the Invert box behind the axis that is inverted. If you have run into different issues and found a solution. Let me know and perhaps I can add it to this section. Run as Administrator: Opentrack will only work if you run it the same as your game. This means that Opentrack will only work if: Neither Opentrack nor the game is run in admin mode. Or, both are run in admin mode. If you have any questions, problems or if you would like to add something: let me know with a message below. To those that already use head-tracking: please share your experience below. Very well written and everything explained clearly. I have been using OT for a long time now and swear by it. You might want to consider going to the opentrack site and adding a link to this on the wiki page. Great post but yikes I tried your profile and....well each to their own and all that. I don't understand why when you look up you sink into the floor of the aircraft? Very comprehensive guide BHH. Well done! I do think the 3DOF trackers like EDtracker are worth a mention though. I was lucky enough to get hold of a TIR5 for almost nothing and whilst its my usual "go-to" device, my set up (armchair for a seat on a family TV in a very sunny room) often makes the less fussy EDtracker a better choice for "get in and fly" days when I cant afford the time taken to set up the camera etc (obviously not an issue for fixed rigs and set ups). Ive also had to go to some lengths to get TIR to work with both the hat reflectors and the Delan-clip. This is because locating the TIR camera on my 40" TV was so hit and miss so I had to concoct an additional arm on my wheel stand pro for it. In fact sitting on anything other than a PC chair with the screen at the normal "office" monitor height can be a problem. This is especially problematic f you are using a big screen TV and sitting lower than its top edge (cos you just LURVS your armchair :-)) since its putting the camera outside of the intended position regardless of it being mounted top, bottom or on the side and results in a loss of tracking. TIR camera range is also limited so may not suit non-standard PC desk/sim pit set ups "out of the box". Although I loose the 6DOF with the EDtracker, I don't feel disadvantaged at all. My set up is a bit odd in that I set it up to transition forward as I tilt my head . In practice this gives a pseudo 6DOF effect akin to looking around the stick if you get what I mean and it more realistically matches head movement when looking over the shoulder. One of the thing that BOS does really well with the EDtracker types is that it allows snap view whilst the device is active. With the ED tracker that's a real bonus that helps to make up for the lack of 6DOF since I can set up views in each aircraft that I cannot obtain with 3 DOF. For instance in the 110s and PE2s I have a quick snap view set to look through the quarter panels of the windscreen so I can get a better view of what is out in front and below. In t5he 109 a view raises the camera view slightly to look a little more over the nose. All that said, the above get round is great for Bombers and GA but you still cant beat 6DOF for dogfighting - but ive gotten so use to the EDtracker even then its no issue and still I prefer the occasional bit of framing or bodywork getting the way to the whole thing throwing a wobbler when the sun comes out! The next house I buy is going to be checked not only for a South facing garden but a North facing gaming room (or better still a dark basement)!! Yes, BoS's snap-views are great and beautifully simple to set up. I use them for quick glances at the fuel gauges on the Yak's wings and the gauges on the Ju-88's nacelles. I had originally planned to add EDtracker as well but decided against it since it only has 3DoF. EDtracker is by no means a bad product. However, EDtracker does not give the user the full experience. On top of that, EDtracker does not take advantage of all features available in opentrack. I felt that it was more important to introduce new players to the full experience. I don't know why it does that. It doesn't for me. Sadly, I have no idea how to solve this either. I bet its the model position calibration made wrong + sensitive Y axis. Your profile works great with face tracking, however I have a few issues with it. Whenever I look up, it decides to look at my instruments instead, whenever I look down it looks up. If I lean to the left it is leans to the right in game and whenever I lean to the right it leans to the left. the only thing that works isthe yaw movement of my head. Edit: Managed to fix this by inverting X and Pitch on the program. I have joined just to be able thank you, for this great guide and for the chance to ad my experiences to it. This is by far the best opentrack guide that I have seen. My intention was to make a comprehensive guide, for using a Logitech C920 webcam and a DIY trackcap with 3 green LED’s, using PointTracker 1.1, freetrack 2.0 Enhanced and Accela. You have already made most of that work, so I will just offer what I have. I am using opentrack 2.3 and will ad pictures later. I use green LED’s, because those was what I could find with enough viewing angle. My triple screen setup is close to 90° when turning from edge to edge. At first I put green foil in front of the lens, but discovered that I could set the camera so its not needed. When the squid flips upside down and the center cross is way off, the camera has lost sight of one or more of the tracking points. In my case the green LED’s. To get back on track, turn your head to front and cover one of the LED’s, for a while, then uncover it again. This can be done with a finger or two. You need to cover the LED a little longer, than the time set in the Dynamic pose timeout field. This is found in the PointTracker Settings Camera tab. In 2.3 there is a Custom model tab. I guess that this is for people wanting to use a clip horizontaly. Directions as I use them here is always based on me looking at the screen, with the camera mounted on top of that. The camera is pointing slightly down at me. I have set this to 500ms, that is 0,5 seconds. For me it opens the C920 settings. These should be set so you can only see your trackpoints. I have everything set on manual, with all but Exposure set to minimum. Exposure is adjusted so I can see the Trackpoints. If you use red or blue LED’s you can set this here. Play around with the settings here, until you get 3 extracted points at all times. Try to be systematic about it, that will make it easier. These should be as accurate as possible. The more accurate the more precise the tracking. I have not been able to get an accurate result, when using the calibration, so I have done it manually instead. 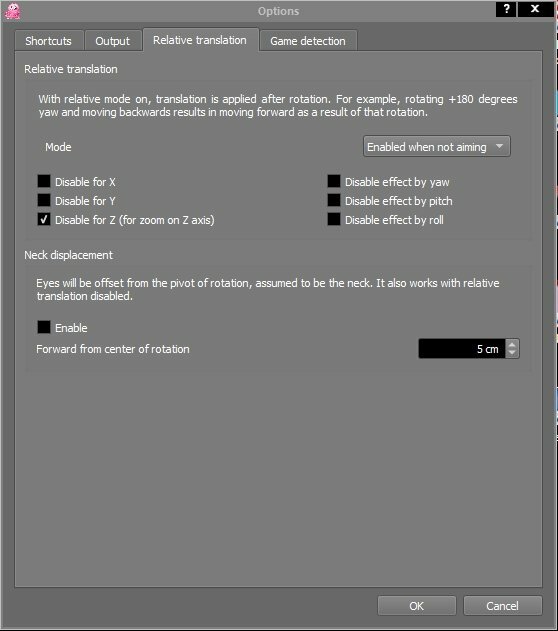 Here directions are for moving the calibration + in relation to facing the screen, that is left is to your left and vice versa. X 0 Y 0 Z 0 in my case is the top center LED of the cap. Some programs don’t like freetrack, others don’t like Trackir. Here you can chose between either or both. If you as me, use a black background, you won’t see these until you hover your mouse above the switch. Chose the ini file you want to use/adjust. These are found in the User Documents/opentrack folder. In my case opentrack-2.3. You can ad downloaded profiles to this folder. Remember to adjust camera and model settings to fit your setup. Sets the current position to look straight forward. This is done while being in the expected working pose. This can also be done automatically when starting the tracker, by activating the “Center at startup” option. Make sure that you are in the working pose, before starting the tracker. If the tracker is not centered when using the Start, Toggle or Restart shortcuts, then just hit the Center shortcut. Toggles between Centered straight forward view and the current pose. Switches to Centered forward view, when pressed and returns to the current pose when released. Stops tracking and turns off camera. Turns on camera and begins tracking. (This takes a couple of seconds), or Stops tracking and turns off camera. This is what I have at this time. I hope that it is usefull. @DanTDBV Thank you for sharing this, there is indeed some new and helpful information in your work. Would you mind if I add some of your work to the main post? Your text from the Model position and Shortcuts could prove to be a useful addition. Your chapter on the loss of tracking gave me an idea as well. I think I will add a chapter on potential problems that might be encountered and how to solve them. Of course, you will be credited accordingly. You are very much welcome to use anything that you want. I think that, a..., a..., troubleshooting guide, is what I would call it, is a great idea. I would like to ask, if it would be okay for me to share a link to this thread, in some of the other forums I use, where it is relevant? Like ED, SimHQ, Racedepartment, reddit Hotas, reddit HotasDIY and others. Of course, you are free to share the link on other forums, discord, TS, steam or any other relevant place. I wrote this topic while focused on IL-2 but it is applicable to other communities and games as well. The more the merrier! I added some of your work. I did rewrite a few lines so it matches the rest of the text. Will get started on a troubleshooting guide one of the coming days. It looks good. I look forward to the troubleshooting guide. I do however have a couple of issues with you Shortcuts descriptions. Some of them are based on my mistakes. I will start with my proposed changes and go over my reasons after. Here you can set up your preferred shortcuts to pause and start and stop your head-tracking. The following commands leaves the camera and tracking on. Center: This will set your current view as the "Look straight forward" point. Toggle: Pauses and lock your view movements. Press it again and you will go back to moving the view around. Zero: Snaps your view to “Look straight forward” and locks it. Press again to unlock. The following commands turn the camera and tracking on and/or off. Note that it can take several seconds for the camera to turn on again. My reasons in random order. I think that the part about the tracking choices, turning on or off the camera is very important. In my research I have seen a number of post’s, about people giving up on opentrack, because turning tracking back on again took to long. They have probably used Start Tracking and Stop Tracking. To me that is the natural choice and I am pretty sure that it is to many. To avoid any misunderstandings, I think that calibrate and system should be left out from the shortcuts. 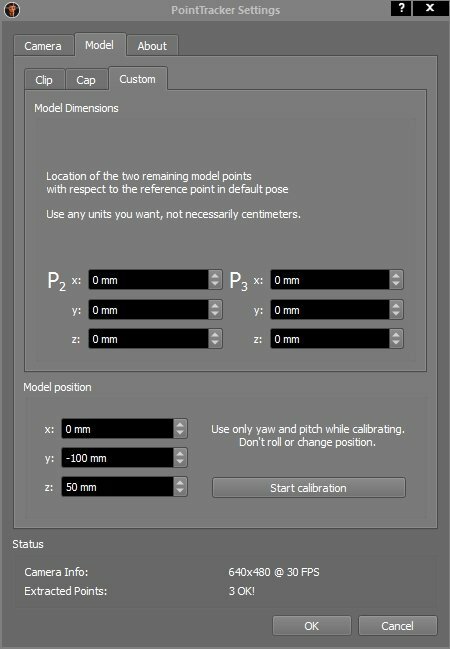 To me calibrate is what I am doing with the model in the PointTracker. In opentrack 2.3.10 Zero locks view to “Look straight forward” There are no movements. Your rewrite inspired me to do one to. Based on sthalik’s answer to another guy, asking for permission to add a link to this thread, on the opentrack Github Wiki, I will go ahead and ad these to the Wiki. Sets the current view as the “Look straight forward” point. This should be done, while being in the expected working pose. Snaps your view to “Look straight forward” and locks it. Press again to unlock. Snaps your view to “Look straight forward”, when pressed and returns to the current pose when released. The following commands turns the camera and tracking on or off. Here directions are for moving the calibration marker (The +) in relation to you facing the screen, that is left is to your left and vice versa. My screengrabber refuses to capture the mouse over's or scroll down picker's in opentrack, so I don't have those. I use Greenshot. 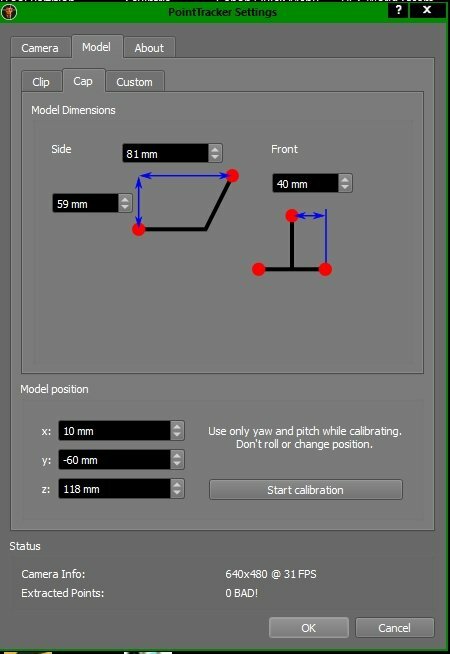 Why am I unable to calibrate on my setup? I have the clip, and a ps3 eyecam, everything works pretty well, but the start calibration thing is greyed out on mine. You will need to start your tracking first. Then try to calibrate. I have added a section Basic troubleshooting to the main post. This section will not fix all problems but addresses the most common issues I get asked about. In all honesty, each of the subjects and their solutions had already been addressed in the main text. However, the section was added to make it a bit easier to fix these common issues on your own. Great explanation, so much I have ventured with a purchase of trackhat. The only problem is there are no photos linked with the text. I saw a lot at the end but unsure of the camera set-up sliders, could you please provide an explanation or pictures. In the section "setting up your Opentrack" each screen is explained in the text with an image right below the text. What other images are you referring to? I am not sure what exactly you mean by camera setup slider. could you be more specific? Thanks for the quick response. 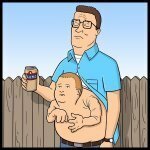 I am not seeing any pictures in your text, all I get is a small cross and the name of the jpg file which should be there at the location of the photo. In fact I am getting the same with the two jpg files at the end of all your posts. I thought it was my browser but I am getting the same on IE, Edge, and Chrome. Towards the end of this post after many replies is a long list of jpg pictures I assume from the text. The one I am not sure about is the settings for the PS3 eye. I tested to see if I could see the images in multiple browsers (Chrome, IE, Edge and FireFox) and they all displayed the images as intended. Not sure why you can't see them. If that also doesn't work, then I will zip them and send a download link your way. Set the "Gain" slider all the way left. The other sliders all the way right. This works best for me but of course, you can play around a bit with the sliders to find your optimal settings. Got my headtracking dialed in pretty well now, I find deadzones for any type of the 3 movements of pitch, yaw and roll are detrimental to the feeling, using deadzones on the x,y,z though helps for me. Just wish I could make them smaller on opentrack. But I flew about an hour last night in a career with the 109f2 and it was just gorgeous to see the game in it's full detail. Might try practicing some more with it. Sticking to single player for now, I find I am still MUCH better at actually flying the plane in VR than 2d. But I am working on it. The graphics are too nice to waste! So headtracking is the bomb diggity and I've been led astray with VR. I shall wait till the new GPU's release to get back into it. Headtracking is freaking glorious, not only are the graphics gorgeous, but the games just more fun for some reason since I am not squinting to read everything on the screen. VR is bar none the best immersion you can get while in the plane, but for everything else it's absolutely terrible. Great to hear that you were able to get it all working so easily. That is the best comment I have seen in a long time! Absolutely love it! And of course; happy that my guide could help you. What do you suggest running for the acella smoothing and deadzone settings? I am currently using 1.6 smoothing and 0.02 for deadzone. Also is there no way to adjust the deadzones for the movement curves in smaller increments than .5 cm? It would seem that is not possible. 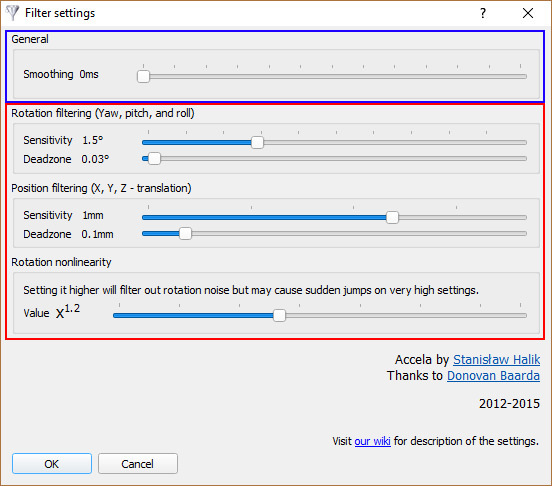 What do you suggest running for the acella smoothing and deadzone settings? I am currently using 1.6 smoothing and 0.02 for deadzone. My settings are as in the image in the first post. Worked fine for years and haven't had anything to complain about it. Of course, that is my setup. You are best off testing your own system with various settings and see what you like. I'd suggest updating the accela picture to the current version. 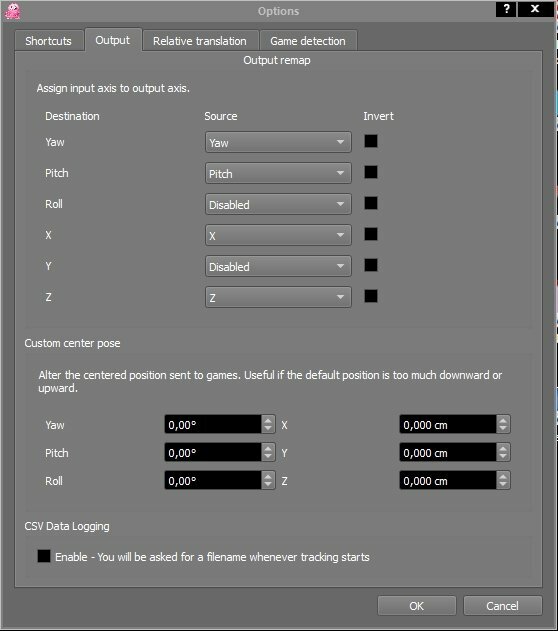 It's using the older 2.2 settings which we do not have anymore with 2.3 There's only 4 sliders now, 2 for rotation and 2 for movement. I'm currently running the 20180803_02 build w/o any issues. I normally test these and let the developer know if there are any issues. Just be careful to back-up your ini files as sometimes the test builds will screw-up your current ini files. The releases before 2.3.10 have it. Only the latest version has it removed. Will add a notification with it to warn other people. Ah! didn't realize that. It would seem I am on that version then. Great Guide! I got trackhat set up in only a few minutes. Playing around with the curves took a bit and headtracking itself took some getting used to but now after using it for 1 or 2 months I´m not going back to using the mouse . Great software! Is there a way to access raw tracker data over UDP or some other output? I am using aruco markers and would like to be able to reference absolute position to avoid recalibration on every load. Great guide! I've been using Open Track a while, and it was working well. Now I realise that you can calibrate with the inbuilt function, it works even better! One question: is it possible to do the following in IL2 with headtracking? Because my tracker goes gets obscured, it often difficult to read the lower instruments. I'd like to set some quick views that look at the lower instruments, and allow tracking to continue off the new 'centre' while my POV hat is engaged. Basically, my head would keep moving, but the POV hat would apply a modifier to the input. Don't think that is possible and if it is, I have no clue how. However, what you could try to set up "asymmetrical mapping" for you Pitch axis. By making the "looking down" more sensitive, you might be able to remedy the problem. May take a little getting used to but that won't take long. That's good advice. It's only recently that I've been flying with the HUD off. Before I never needed to look at the gauges! I was missing out. They are so beautifully modelled. Very good guide well written and everything is well explained with details. I have been using OT for a long time and I am very satisfied. Thank you. I cant save a new pilot head center pos unless I end Opentrack program, I use edtracker(works great) with opentrack(also works great) but no joy when I want to save new center pos. It works if start IL-42 without starting opentrack program(latest version). It doesent matter how mutch I hit F9 key when opentrack is running, opentrack seems to overide IL-2 when using F9 modes.